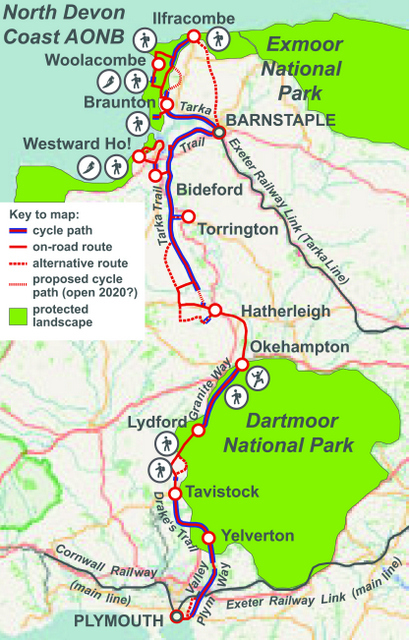 The Devon Coast to Coast is southern England's best developed cycle route. 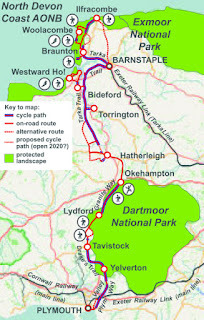 Traffic-free paths on former railway lines, such as the Tarka Trail, Granite Way, Drake's Trail and Plym Valley Way, allow you to explore Devon's stunning countryside at an easy pace. 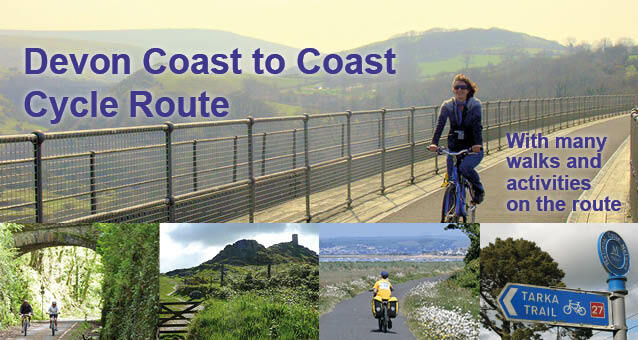 Whether you are young or old, fast or slow, the limited mileage and stunning countryside makes the Devon Coast to Coast an adventure suitable for all! If you love sightseeing from your bike, you can't go wrong with my latest guidebook! The total length of the route is 81-117 miles (130-190 kms), depending on the route options you choose. The guidebook of 40 pages allows you to fully explore the route and its sights. If you do all walks and activities listed in our guidebook, it could easily take you a week or more! Special features: All the maps you need, full north-south directions, detailed visitor information, things to see and to do, help for tricky logistics, Plymouth station route, extra routes, including a 99.9% tarmac route for narrow tyres, South West Coast Path and Dartmoor walks and full facility listings (hotels, B&Bs, hostels, campsites, bike repair shops and bike rentals). The book comes in our usual convenient spiral-bound format, easily fitting in a standard bag on your bicycle's handlebars! You'll also receive GPS-tracks of the main cycle route via email as part of the deal. The price of the book & GPS-tracks is £11.99. You can now purchase this pack for the same price on-line as you would find it in any UK shop. There is no charge for postage within the UK! For postage to all other countries, there is an extra charge for postage (EU-countries £2.50, any other country £4.50), but the cost of dispatch within the UK is still discounted! You can order this book from anywhere in the world via the PayPal menu below. Devon Coast-to-Coast Guidebook & GPX: select your region! Please note: for all orders, we are dependent on normal postal services for the delivery of the books. Allow one week for the book to arrive from the moment of ordering (United Kingdom only). Delivery to any address outside of the UK may take one week, but also up to three weeks. It is our intention to dispatch goods within three working days! About your order: The payment of your order will be processed by PayPal on behalf of EOS Cycling Holidays Ltd, the publisher and cycling holiday company of the author of the book. If you are for any reason not happy with your purchase, please write to EOS Cycling Holidays Ltd, 11 Elmswood Avenue, Manchester, M14 7JR, United Kingdom or contact us. On sales of our guidebooks and GPS-tracks packs, Article 1 and 17 of our full Terms and Conditions apply, available via www.eoscycling.com. Orders from outside the European Union: We cannot predict whether the Customs Authority of your country might impose an additional import tax fee on the guide book we send you. We send guidebooks to various non EU-countries on a regular basis and don’t know of any cases in which an import tax was applied. Import fees where applicable will need to be paid for by the buyer as instructed by their Customs Authority. Disclaimer: The publisher and author have done their best to ensure the accuracy of all information provided on websites, in guidebooks and via products such as GPS-tracks-packs. However, they can accept no responsibility for any loss, injury or inconvenience sustained by any traveller as a result of information or advice contained in our publications. Additional Terms and Conditions on GPS-tracks packs sales: We do not provide additional support for those experiencing difficulties displaying GPS-tracks on their devices and regret we cannot advise you on which product to use. GPX-files are provided in standard exchange file format. We do not reimburse you if you, for any reason, are not able to use the files provided. Feel free to contact us to request a test-file, so you can check whether our files work on your device before placing an order.